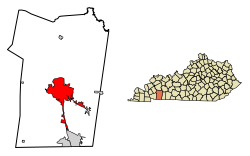 ^ a b Commonwealth of Kentucky. Office of the Secretary of State. Land Office. 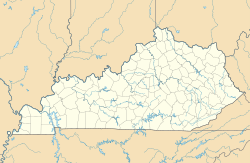 "Hopkinsville, Kentucky". Accessed 30 Jul 2013. ^ a b c “Dictionary of Places: Hopkinsville”. Encyclopedia of Kentucky. New York, New York: Somerset Publishers. (1987). ISBN 0-403-09981-1. ^ list of manufactures Archived 2011年6月11日, at the Wayback Machine. ^ Trail of tears park.